John comes to AAI with over 17 years of guiding experience and over a decade of nursing experience in critical care and emergency medicine. He completed a graduate degree in Nursing from The University of Colorado and is a Certified Nurse Practitioner and works in Internal Medicine as a Hospitalist. He is also pediatric life support, advanced life support and a trauma certified nurse. John specializes in advanced and complex wound care. Additionally John is very interested in wilderness medicine and teaches Wilderness First Responder courses for Desert Mountain Medicine. John grew up rock climbing in New England before moving to Colorado where he now lives in Carbondale and escapes to a tiny house in Marble, CO with his wife and wolf hound for weekends. He has 22 years of rock climbing, ice climbing and mountaineering experience and has worked for Alpine Ascents International for the last 6 years guiding in the Cascades, Alaska, Argentina and Nepal. 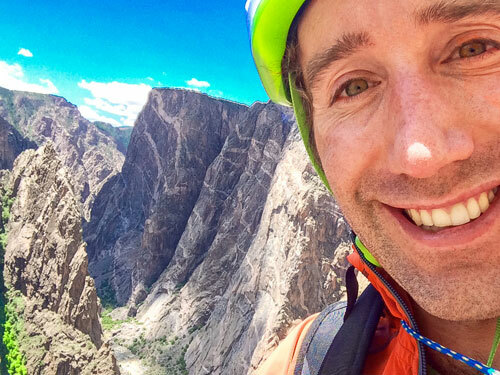 John’s main passion include growing a beard, training Tony Yaniro style in his garage and establishing new rock climbs on the Western Slope of Colorado. He has over 100 first ascents to his name. John hopes to share his passion for climbing and healthy living to all. His priority is to provide high quality guided experiences to all his clients at Alpine Ascents International. Over 100 first rock climbing ascents in Colorado alone, overwhelmingly in the 5.12-5.13 range. Several Yosemite classics including El Cap’s Nose, Half dome and Washington’s Column. Dozens of Routes in the Italian Dolomites including The Tre Chime di Lavaredo and Tofana di Rozes. Alaskan Ruth Glacier Expeditions including The Stump’s Gold Finger. Alaskan Little Switzerland Glacier Rock Climbs. Elk Mountains Capital Peak Northwest Buttress. El Potrero Chico classics such as Mike Lewis’s Guppy in the Surfa Rosa cave. Almost a dozen Black Canyon of the Gunnison big wall climbs. Many of Squamish British Columbia’s incredible cracks. Several routes on Grand Junctions Independence Monument and the Desert Solitaire Buttress. Multiple routes on Castleton Tower and The Rectory including Fine Jade. Red Rock’s The Rainbow Wall and incredible Texinepherine. The High Sierra’s Merriam Peaks North Buttress, and solo ascent of Bear Claw Spire. Winter ascent of the Sierra’s Incredible Hulk’s Red Dihedral. Many of Tuolumne Meadows classics including Oz and Fairview Dome. Northern Patagonian Frey routes including Torre Principal and Aguja Champanile. The North Cascades Liberty Crack. Washington’s Mt. Stuart’s direct North Ridge. Sub 24 hour Solo of the Matterhorn’s Hornli Ridge. Several Northwest volcanos including Mt. Baker, Mt. Hood, Mt Adams and 6 routes on Rainier including Liberty Ridge. Speed ascent of the Solu-Khumbu’s Lobuche Peak. Over 12 winter ascents of Mount Washington including most Ice Routes in Huntington Ravine. 6th Person to ever complete the Elk Mountains Highlands ridge Traverse. Tope 10 placement multiple years in Aspen’s Power of Four 13,000 vertical feet of climbing Ski Mountaineering Race. Colorado Classics including Stairway to Heaven, The Drool, The Ribbon, The Rigid Designator and Ouray Ice Parks WI5+. Many of New Hampshire’s Frankenstein Ice classics.